The Ridgeback MX24 is a lightweight bike designed for 9 – 13 year olds and features a Suntour XCT 24 suspension fork for a smooth and comfortable ride. The MX24 is perfectly proportioned to provide younger riders the best comfort and control whilst still enjoying their ride. Designed around the Metro disc frame platform, Vanteo open frame is equipped with Shimano Hydraulic Disc brakes, Shimano Disc hubs and Shimano transmission system making this is a durable, practical bike designed to provide an excellent experience whatever the terrain. Practical, reliable and stylish. A Ridgeback Metro is the perfect bikes to get you from A to B. The Ridgeback MX14 is a lightweight bike with a rugged aluminium frame making it easier for little ones to handle while still being tough. Off road tyres provide stability and traction, the ridgeback MX14 is a great bike specifically designed for smaller riders. The Ridgeback MX16 is a lightweight bike with a rugged aluminium frame making it easier for little ones to handle while still being tough. Off road tyres provide stability and traction, the ridgeback MX16 is a great bike specifically designed for smaller riders. The Ridgeback Honey is a lightweight girls bike with an aluminium frame making it safer, easier and more fun for little ones to handle. 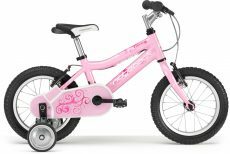 The Beautiful pink frame with floral graphic will make your little cyclist feel very glamourous and proud when riding it.